This article may be linked somewhere on this site, but thought it would be helpful to have it here. Q) I purchased a new Suzuki Savage 650 last July. 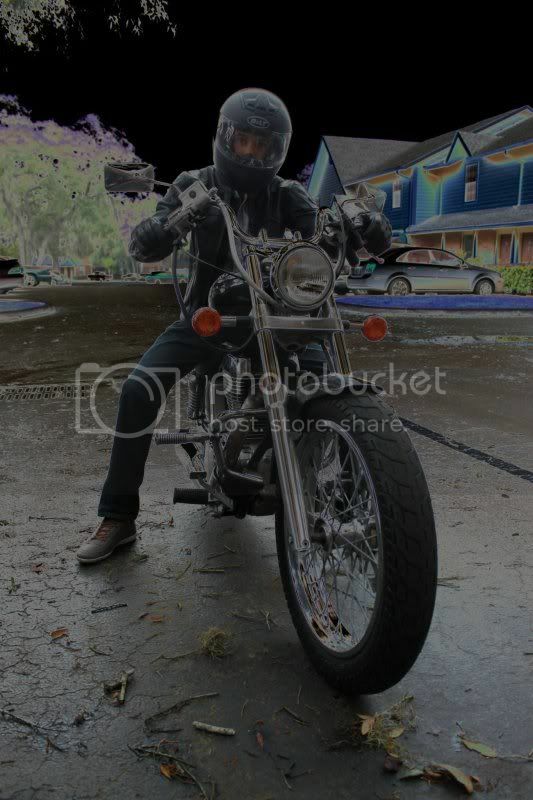 From the very beginning the motorcycle would backfire when decelerating or coming to a stop. I took it back to the dealer twice before the 600-mile service, and complained about it at the initial service. I have tried different grades of gasoline and they seem to have no effect. The dealer has told me that I should expect backfiring with the design of this engine and that it should decrease as I build up mileage. I have 900 miles on the bike now and backfiring doesn't seem to be decreasing. I have found other riders of Suzuki Savages that are having the same problem. - Jay Coney, Kerrville, Texas. A) This column receives a lot of mail over the course of a month, and the single biggest gripe among our readers are problems with lean-running. late-model carbureted bikes. The poor old LS 650 really suffers at the hands of the EPA, and I certainly sympathize with you, Coney. We can fix it, but first let me explain the hows and whys. When the throttle of any engine is rolled or snapped shut, some fuel is drawn through the engine and kicked out the exhaust without being burned. In abundance, this raw fuel vapor can be smelled, tasted - and when light is passed through it- seen. It's referred to as photo-hydrocarbons or more commonly smog. Yes, there are several other pollutants coming out of the exhaust, but the human senses can't detect them. The manufacturer of motorcycles have three methods of dealing with excessive hydrocarbons. Forcing air down into the exhaust port with an air pump and diluting the outgoing fuel vapor is one method. Kawasaki pioneered this method with their 'Clean Air System', which employed a vacuum-driven pump that puffed air through reed valves placed over the exhaust system. A 'cat' is nothing more than an oven which bakes the hydrocarbons, burning them off. The most common method is to simply lean out the carburetor. The low-speed and midrange circuits of the late-model carburetor are not adjusted to give optimum performance - they're set up to produce a minimum hydrocarbon count on deceleration. What miserly amount of fuel they do deliver to the combustion chamber when the throttle is closed causes misfire and an audible afterfire in the exhaust pipe. Now, I haven't mentioned fuel injection or other exhaust gases. As I said, the bulk of complaints from readers of this column is deceleration backfire and also poor idling of carbureted engines. No doubt we'll get around to discussing other emission-control devices and their problems in future issues. 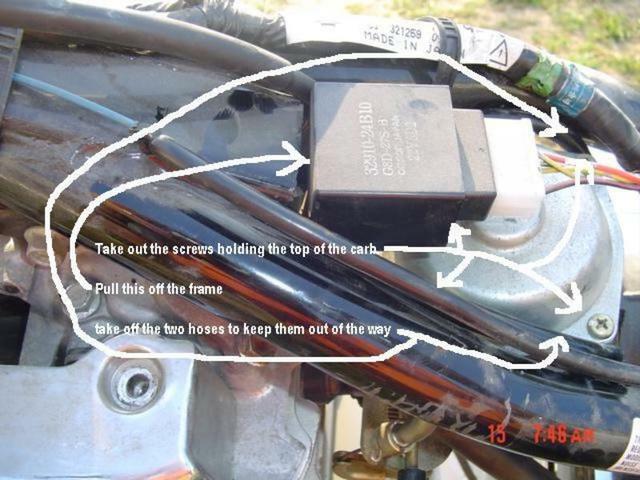 Getting back to your Savage 650, Coney, here's how we can specifically cure its problem. We need to richen those two areas of the carburetion curve that are factory set on the ridiculous side of leanness. 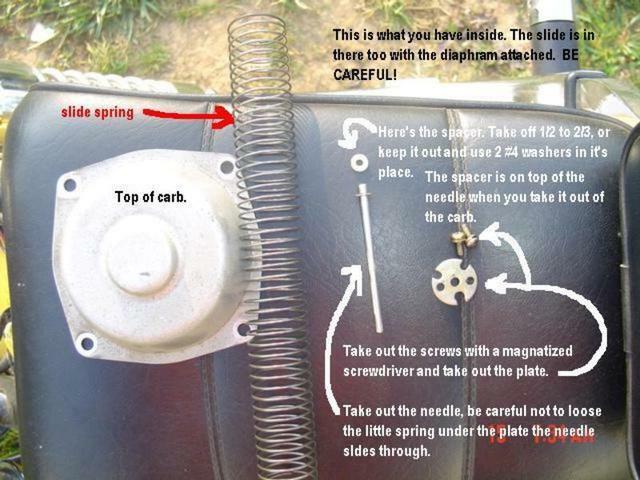 Remove the diaphragm slide from the carburetor and look down inside its bore. Two small screws hold a plate over the slide needle. Removing the plate, you'll see a small, white plastic spacer with a hole through it sitting on top of the needle. Throw that spacer away and reinstall the plate. A spring under the needle clip will now push the needle up to the plate occupying the space vacated by the white spacer. The distance that the needle has been 'lifted' is the thickness of the discarded spacer - and that's ideal. With the needle raised, more fuel will flow by it, meeting the actual needs of midrange running. We can also fatten up the low end of your bike's carburetor by turning out the low-speed mixture screw. To gain access to this screw, you'll need to drill out the brass plug pressed in over it and yank it out with a sheet-metal screw attached to a slide hammer. You'll find that plug up high on the right side of the carb about where the mouth enters the carburetor. Usually Suzuki applies a splash of white paint over the brass plug so that it's immediately noticeable. With the engine warmed up and idling, turn the mixture screw out incrementally until you achieve the highest idle. There will be no doubt in your mind that you're making progress because the idle will come up and sound stronger. At this point, turn the idle adjuster knob out and bring the idle back down to a leisurely gait. Just these two, relatively simple adjustments will not only eliminate the backfire, they will make an amazing improvement in throttle response and driveability. Only remove 1/2 of the spacer at first or at least replace with one or 2 #4 washers so that the dimple in the plate can do it's job. A few on this site have reported that removing the whole spacer causes an over rich condition in the mid range and even a raw feul leakage at idle that was corrected with putting some 'space' back in. Mine runs great with a 1/2 spacer. Local conditions will determine YOUR proper amount of 'space' to remove...but just tossing it all is assuming too much and may cause you other problems. Have to agree with rkutzner on the spacer. Have now had the chance to test with three different spacer conditions: none, 1/2 and 1/3. For my bike and where I ride, the 1/3 spacer proved to be the most driveable and the best compromise in terms of lost mpg. --- am running a 155 main. I agree with red2k1 agreeing with rkutzner. My bike flooded at idle with the spacer totally out. Half spacer is good for my bike with a 155 main and hollowed-out stock pipe. You're right, low and mid range performance stunk. I've since put on a sportster muff and got my power back. Sure do miss the loudness though. Just for kicks while I had the muff off I ran with the open header for about 10 minutes. [glow=red,2,300]LOUD! [/glow] So loud it was near painful. Ran OK, but not good. The sportster muff is the best performance I've had so far, and no backfires with a 155 main and half-spacer. Sounds decent, but not loud. does that mean i still have to go up a jet to change to a sporty muffler? is it difficult to remove the brass plug? You're probably OK with your 155, just try it and see how it runs afterward. If it backfires or has lousy throttle response you can jet up or play with the spacer thickness on the needle. I drilled out my brass plug and pried out the remains. I went a little too deep, hit the mixture screw and boogered it up. But there was enough of a groove to be able to remove the screw and cut a new groove for a good screwdriver bite. It ain't that hard, just pull out the bit often to make sure you're not going too deep. Below are some photos by Steelwolf from his white spacer mod to help anyone doing this. Correct me if I am wrong, but it looks like from the photos above, The Spacer, Main & Primary jets can all be accessed via removing the top cover of the carb. All the time never removing the carb from the bike. That makes it a lot simpler job. Yep, you're wrong... or half wrong which is the same as half right. Which one do you want to be? Only the spacer can be gotten to from the top. Main and Idle mixture jet are gotten to from the bottom. Also can be done with carb installed. iS 4 5/8 OK, or should I be looking to re-jet enabling me to get that mixture sCrew closer to 3? No, it's very likely that you loose the screw going down the road. Go up to the next size. 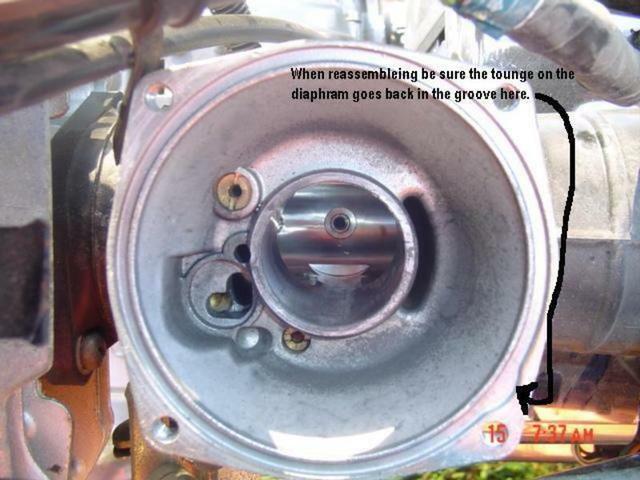 Also, I asked this in another thread, does the 86 carb have the white spacer too? Yes, all models have the white spacer. And if I remove the spacer do I likely need to re-jet? yes, maybe. Raising the needle will add more fuel sooner. Best to follow procedure and tune for the top end 1st then adjust the mid range. Ok just finished half of this mod. I pulled the brass plug, use a very very small steel drill bit and drill a small hole into the plug, try to get all the way through but don't hit the screw behind it. Then put a small drywall screw in it and twist using a hand screw driver. Just get it caught in there then grab it with a wrench and pull HARD. It takes a good bit of force but it will pop out. I did want to do the white spacer mod as well but failed. The reason why I couldn't do it is frustrating. I lifted off the tank which was really simple, take the seat off then undo the screws and pull! I managed to remove the hoses and work on the top. After stripping all four screw on the diaphragm cover I drilled these screws out. I later replaced them with stronger, better screws. After finally getting the diaphragm out I tried to get the two screws inside it and stripped those too. I have the exact screwdriver for the job, the screws were just in TOO tight and were made of soft metal. I could not find a way to get them out without risking damaging the diaphragm so I just cleaned the carb and put it back together. I really would like some help trying to find a way to fix this problem without spending much money. How to get those stripped screws out? Yes, Habor Freight has a small size impact driver for less than $10 and comes with a few driver bits, one of which is longer and fits the screws down inside the slide. It has been reported here that the tiny screws found inside computers work perfectly and are made of much harder metal so will not strip so easily. Do not turn the pilot screw on the carb out more than 3 turns or it is possible to loose it on the road as mentioned. When out 3 turns it is time to move to a jet one size larger and then adjust the pilot screw again starting at 1 turn out. 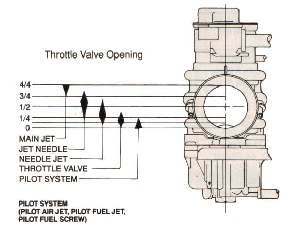 With a properly sized pilot jet for your engines setup, the pilot screw setting should end up being in the 1-2 turns out range when the engine is running at its highest rpm. Then readjust idle rpm for 1100 rpm. As long as the carb is CLEAN inside and everything is working properly then the carb will respond to jetting & tuning efforts.